It is widespread and costly, so it attracts interest. It is treated with stimulant medication, and medication use has skyrocketed, raising questions about how diagnosis is conducted. 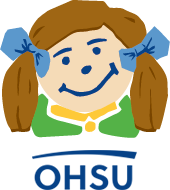 Most crucially, over time, some children naturally get better while others have very poor outcomes, and we cannot yet predict which are which. A major scientific focus is to identify biologically sound subtypes that will add to clinical prediction. 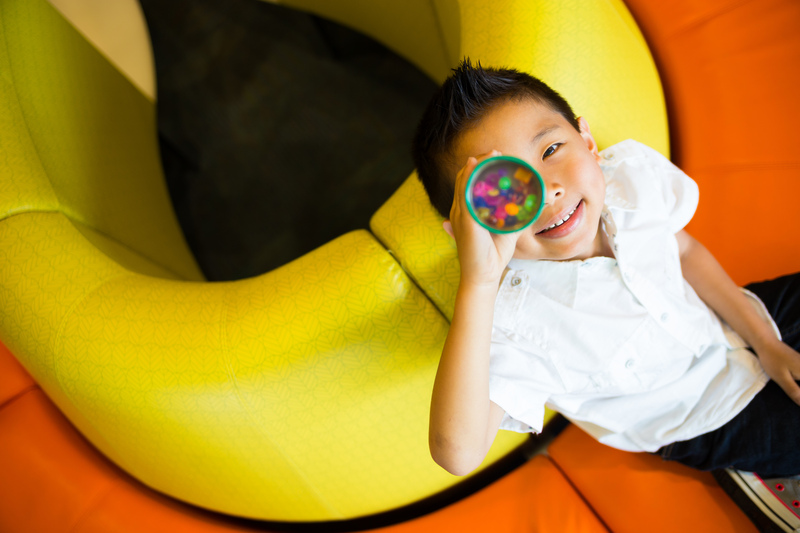 In the OHSU ADHD Program, we are pursuing a neurobiologically informed model of subtypes that takes into account both the emotional and the attentional aspects of these children’s struggles. 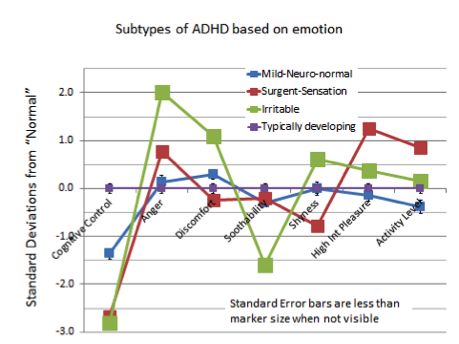 The figure on the right shows that one cause of ADHD is in disruption of attention and another cause is in disruption of emotion. However, we don’t yet know if these are independent. The approach also takes into account that their difficulties have a volitional component (partly under their control) and an involuntary component (partly beyond their deliberate self-control). For that reason the figure above depicts “bottom up” (involuntary) and “top down” (controlled) processes. 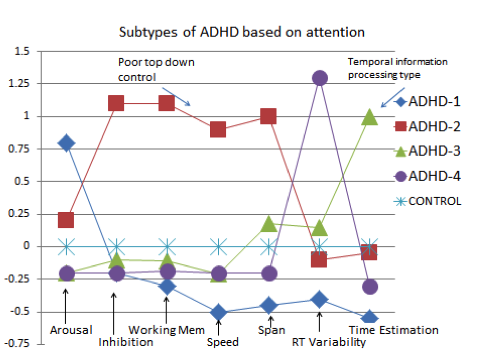 When we organize the data based on performance on a broad battery of neuropsychological scores, we see that there is a group with problem in attention (controlled attention), and another group with problems in time processing; the other groups have problems in terms of low arousal or alertness. A second study (3rd diagram) shows a similar analysis from the perspective of emotion processing. It shows that one group of children with ADHD is characterized by highly irritable, angry behavior, another simply by exuberant behavior, and a third by normal emotional processing. Again, we can map these domains into known neurobiological pathways. In this last example, we also found that using this typology we could predict one year later which children were doing worse and which ones were not doing worse. We could do so far more accurately than with existing clinical tools. 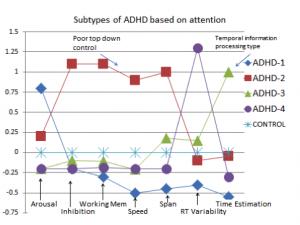 Therefore, this approach is promising for improving clinical prediction in ADHD. What can you predict, in terms of adolescent/adult behaviors like school failure, drug abuse, and criminality, based on these subtypes?